The strains of the main theme to The Magnificent Seven (1960), highlighted in the opening credits and woven into the score throughout the movie by its brilliant composer, Elmer Bernstein, are instantly recognizable, even if you have never seen the film. So iconic is the music that underscores this epic tale of dusty desert adventure that it has become associated with the Western genre as a whole, borrowed numerous times for other thematically-similar enterprises over the years—enterprises as disparate as commercials for a particularly popular cigarette brand and a cowpoke-centered episode of The Simpsons. The rousing tune immediately sets the tone for the film–it’s a battle cry, a call to arms that thoroughly anticipates the heart-pounding action ahead. The plot of the film is simple, yet effective: Chris (Brynner), a fearless gunslinger, is approached by a trio of poor Mexican villagers for help. Their town has been raided by the bandito Calvera (Wallach), whose men take most of the harvest, leaving the villagers with barely enough to survive. They have crossed the border into Texas in search of guns to ward off Calvera’s promised return, but Chris tells them that they would be better served by hiring experienced men to defend the town. Though the pay is meager–a mere twenty dollars per man for an estimated six weeks’ work–Chris is eventually able to recruit six other gunslingers to accompany him into Mexico: Vin (McQueen), a handsome gambler; Bernardo (Charles Bronson), a gruff, strong man with a soft spot for kids (especially one particular trio of nosy little punks); Lee (Robert Vaughn), a hired gun dodging the authorities; Britt (James Coburn), a taciturn fellow who demonstrates a knack with a knife; Harry (Brad Dexter), an old friend of Chris’ anticipating a rich payment of gold and jewels for his work; and Chico (Horst Buchholz), a young, temperamental man who left his own village in Mexico seeking adventure as a hired gun. Though the Seven’s reception in town is somewhat chilly due to the farmers’ initial fear of them, they eventually manage to fortify the town and teach the townspeople to fight, just in time for Calvera’s reappearance. But the showdown between the gunslingers and the bandits does not go quite as smoothly as the Seven had hoped. The Magnificent Seven borrows quite heavily from its Japanese predecessor, from the general mirroring of the plotlines and the similar characterization of each film’s respective “warriors.” And while they share some thematic elements–such as the importance of honoring commitments and responsibility to those who have contracted their trust–the central conceits of each film are quite different. Samurai focuses largely on the inherent class differences between the farmers and their champions, an issue that is rather obliquely addressed in TMS, mostly through the character of Chico, a farmer’s son who understands–and resents–the fearful nature of the villagers; because of this, Chico spends the final third of the film fighting his feelings for a young village woman, Petra (Rosenda Monteros), as he is loath to return to that limited life. 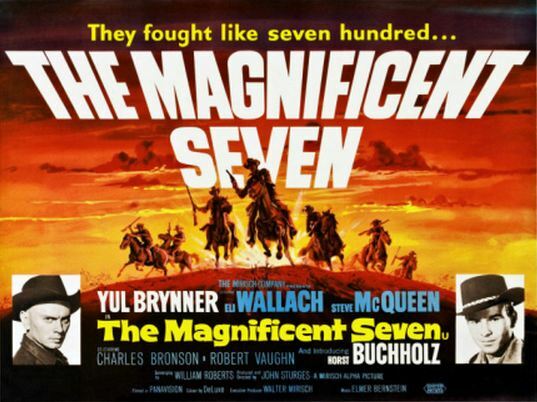 Overall, with its strong performances, beautiful desert vistas (thank you, Panavision), and entertaining, engaging storyline, The Magnificent Seven is an appealing mix of drama, well-staged action, and light comedy–and in my thus-far limited experience with the genre, this film is on par with Cat Ballou (1965) in combining those elements into an effective, singularly enjoyable Western adventure. I am glad to say that this movie is, without a doubt, one I’ll be returning to again and again in the future. Look for another entry in our ongoing “Learning to Love … Westerns” series next month! ← Blogathons? Yeah, we need some stinkin’ blogathons! There’s a delightful novel called ‘Into the Beautiful North,’ about a small Mexican town who, inspired by ‘The Magnificent Seven,’ send a group of young girls on a mission into America to find men willing to live in their town and help revive its sagging prospects. In the passage where the townspeople watch the movie, a rivalry breaks out between fans of McQueen and fans of Brynner, who is mistaken for a Mexican himself. Very warm and sweet book. Well. I have never seen this film because I’m not partial to Westerns. That’s why I was excited to hear of your “Learning to Like Westerns” series. You will be enriching my movie-watching experience, too. Great review, glad you fell in love with this movie, as it’s one of the most crowd-pleasing and iconic of westerns, with a dream cast. Nice to see you point out some of the deeper themes in a film that is usually only thought of as a breezy entertainment. I’m with you on despising those little brats who get Bernardo killed. That annoys me every time. (Though that dialogue exchange you reference is very funny, and perfectly delivered by boy #1). I look forward to reading more about your Learn to Love Westerns project….they may not all be as fun as THE MAGNIFICENT SEVEN, but it’s a rich and rewarding genre.